By Eric Thomas: Manny Pacquiao (60-7-2, 39 KOs) will be defending his WBA World welterweight title against Adrien Broner (33-3-1, 24 KOs) this Saturday night on SHOWTIME PPV in a fight that promises to be an exciting affair from start to finish at the MGM Grand in Las Vegas, Nevada. This is easily the biggest fight for the 40-year-old Pacquiao since his loss to Floyd Mayweather Jr. in the ‘Fight of the Century four years ago in 2015. The televised fight card on SHOWTIME PPV starts at 9:00 p.m. ET / 6:00 p.m. PT. This is Pacquiao’s first fight in the United States since his bout against former World Boxing Organization welterweight champion Jessie Vargas in November 2016. Pacquiao won that fight by a 12 round unanimous decision to take his title. This fight is supposed to be a one-way affair for Pacquiao, but Broner will have something to say about that. He’s ready to beat Pacquiao and become a boxing icon. A victory for Broner would give him the elusive signature win that he’s been looking for since he turned pro 11 years ago in 2008. Broner, 29, isn’t one of the elite level welterweights in the division, but he’s still one of the more popular fighters, and he’s got talent and power when he’s fighting at his best. Manny wants to be involved in bigger fights against Mayweather Jr., Errol Spence Jr. and Mikey Garcia. Those are the matches that will bring in a lot of PPV buys on Showtime for Pacquiao. However, he cannot afford to overlook the always tough former four division world champion Broner, because he still has enough ability to beat the likes of Pacquiao if he’s not at his best on Saturday night. “Even at 40 years old, I can still show the best of Manny Pacquiao. 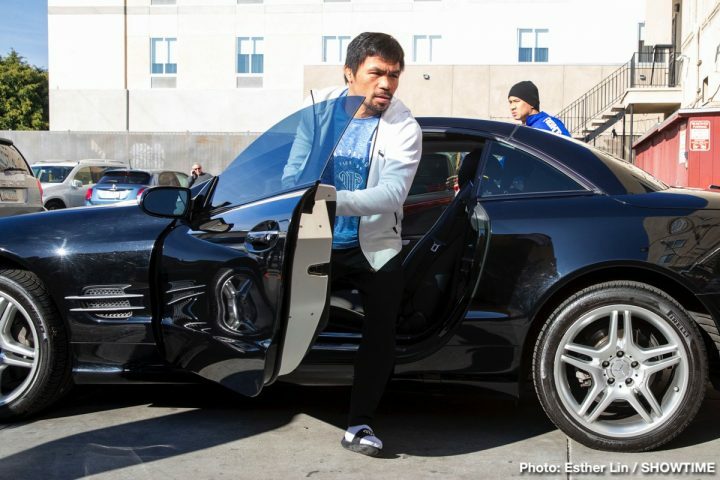 I’m going to give the fans the speed and power that they’re used to seeing,” Pacquiao said. Pacquiao is putting a lot of pressure on himself my looking to knockout Broner rather than just beat him by a 12 round decision. Broner has never been knocked out before in his career, and it’s crazy for Pacquiao to be thinking that he’s going to be the first to stop him at age 40. Broner has mixed it with some of the hardest punchers in the welterweight division in the past, and he’s not come close to being knocked out. If Marcos Maidana, Shawn Porter, Mikey Garcia, John Molina Jr. and Daniel Ponce De Leon couldn’t knockout Broner, then it could be a mistake on Pacquiao’s part to be trying to do something that younger fighters than himself couldn’t do. “My journey in this sport is still continuing. I’ve accomplished everything I’ve wanted to, but I also want to continue to keep my name at the top,” Pacquiao said. Broner has the Mayweather-esque fighting style, which we found out in 2015 is the Kryptonite to beat Pacquiao. All Broner has to do to defeat Pacquiao is follow his many years of training in the Mayweather style, and he should be able to pull off the upset on Saturday night. Mayweather beat Pacquiao using his jab, and well-timed right hands. Mayweather listened to his dad when he told him to start pressing the fight to Pacquiao in the second half of the fight. Pacquiao struggled once Mayweather started walking him down. That’s what Broner is going to have to do, since he’s not going to win rounds holed up on the ropes, letting Pacquiao shell him with his heavy artillery. Broner is the opponent in this fight, and that means that he’s not expected to win. He knows this, the judges know this, and Pacquiao knows it. For Broner to get the ‘W’ on Saturday, January 19, he’ll need to be the aggressor the entire fight. To take the title from the champion, Broner has to rip the strap away by outworking Manny and not letting him dominate the rounds like he normally does. Pacquiao can still move well, and throw shots from different angles. Broner has got to be ready to deal with the different attacking angles Pacquiao brings to this fight. The best way for Broner to deal Pacquiao a defeat is to meet his attacks head on by punching with him. Broner can’t back up against the ropes like he’s done in the past in his losses to Shawn Porter, Marcos Maidana and Shawn Porter. Broner goes to the ropes even in the fights that he wins, but he’s been lucky to get away with it. The co-feature bout on the Pacquiao-Broner card is an interesting one between Badou Jack and 2012 U.S Olympian Marcus Browne. That’s going to be an exciting fight for as long as the bout lasts.